One of the best holiday memories I have from childhood is my yearly visits to Hershey after Christmas. For several years running, my family would pack up the car the day after Christmas and head to the Hershey Lodge for 3 days and 2 nights of chocolate-infused fun. It was nothing short of magical. It was the festive excitement of Christmas filled with chocolate, rides, food and more. As a kid, you can't really beat that. Our days were packed with visiting all of the fun attractions and participating in the various activities the Hershey Lodge offered (hello, Chocolate Bingo!). For me, Hershey and Christmas were wrapped up in one overwhelmingly wonderful package. As the momma of two sweet girls, it is my aim to fill their holiday season with joy, wonder, excitement, fun and awe. Last year, I wrote my Philly Area Holiday Bucket List compiling all of the holiday ideas and fun for families that I could think of. It's applicable year after year - so if you need ideas on what to do during the holidays, go check it out. Last year we introduced the girls to the wonder that is Christmas in Hershey for the first time. We went as a day trip, and knew immediately it was just not enough time to do and see all of the fun things Hershey had to offer. On our way home, as the girls were snoozing in a chocolate-induced haze, Hubby and I agreed next year we'd go to Hershey for an entire weekend for the holidays. And it was magical, of course. What is better than Hersheypark? Hersheypark all decked out for the holidays! Christmas Candylane is the epitome of festivity. Adorned in over 2 million twinkling lights, Candylane has rides, shops, music, seasonal shows and, of course, our favorite Hershey's Characters all dressed in their holiday best! Hours vary. Cost: $12, 2 and under are free! Santa knows that Hershey is the sweetest place to be, so he set his trusty steed up right! Santa's Stables is a fun aspect of Candylane, where you can get up close and personal with Santa's crew. Real reindeer hang out in stables built personally for them. It's a great way for them to keep an eye on kids for Santa in this crucial "Naughty or Nice" time of year. This has always been one of my favorite attractions, and you could spend an entire day at just this one location! Chocolate World is the hub of all things chocolate, and there is a TON to do. Start with the Hershey's Great American Chocolate Tour ride (it's free!) where you can learn about the bean to bar process. The best part is that the tour ends with a piece of chocolate for everyone! We also checked out the Chocolate Tasting Adventure, which teaches you the art of tasting chocolate correctly. It's fun to watch the kids try so hard not to just chow down on the chocolate (and, instead, let it "melt on their tongues). Head to their website to learn more about the other Chocolate World attractions (including Create Your Own Chocolate Bar!). As I said earlier, there is so much to do in Hershey during the holidays, you really have to stay at least the weekend to take it all in. 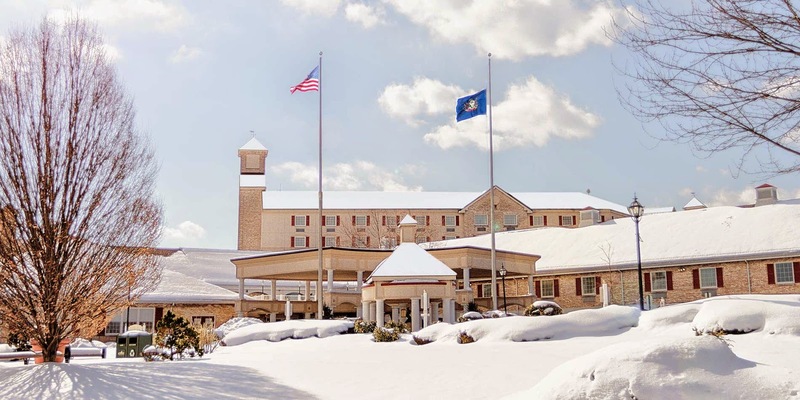 Luckily, Hershey is home to great accommodations: Hotel Hershey and the Hershey Lodge. When I was a kid, we stayed at Hershey Lodge - so it has a special place in my heart. The Lodge is a convention center, so it's sprawling wings are all connected. You could literally walk in the doors and go to all of the lodge attractions without ever having to step foot outside. After deciding to stay over this year, we made our reservations there. Even after 20 years away, it is still the place to be! They've remodeled since my youth, and I am completely blown away by the upgrades. Upon arrival, guests are greeted by the grand lobby, with exposed beams, high ceilings and rustic stone. A four-sided fireplace is at the center, a hub for several restaurants and gift shop. Rooms were nicely appointment and comfortable. And, for the snow birds visiting in winter, there is an INDOOR POOL. At the Hershey Lodge , you'll never be bored. Aside from having Hersheypark and Chocolate World at your disposal, the Lodge at Christmastime is host to a flurry of activities. During our weekend alone, there was the tree lighting (where Santa and Mrs. Claus made an appearance), Chocolate Bingo (both girls won a bag of Hershey's candy! ), Pool Games and a holiday craft. Each weekend offers similar activities - which helps break up the day so you aren't going from attraction to attraction. Enjoy dinner AND a show this year at Hershey. 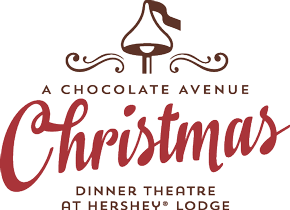 A Chocolate Avenue Christmas plays at the Hershey Lodge. This show is produced by an EMMY Award-winning team. Spend time with family and friends enjoying an elegant Christmas dinner and dessert followed by an unforgettable production. Guests of all ages will be delighted to see their favorite holiday songs and memories come to life! If you want to get some holiday shopping done in the Sweetest Place on Earth, head to the Tanger Outlets in Hershey! All of my favorite stores sit just outside park. Hubby and I both loved the chance to take a break from attractions and peruse the outlets. The kids love it because there is a Disney Store! It's a nice way to break up the day (and maybe pick up some last minute gifts). I'll be honest. I loved this just as much as Hubby did. Troegs is one of Pennsylvania's finest independent brewing company. They have a great line-up of beer, and during the holidays I can't pass up a pint of Mad Elf Ale. Hubby enjoyed a Session that was on firkin, specially spiced with basil, lemongrass and ginger. The beer hall-esque tasting room also has a Snack Bar with a menu that delivers crispy pork belly with maple glaze, poutine, charcuterie and more. I found Troegs to be super family-friendly, so worth a visit even with kids! Hershey PA is on Facebook and Twitter. Hersheypark is on Facebook, Twitter and Instagram. 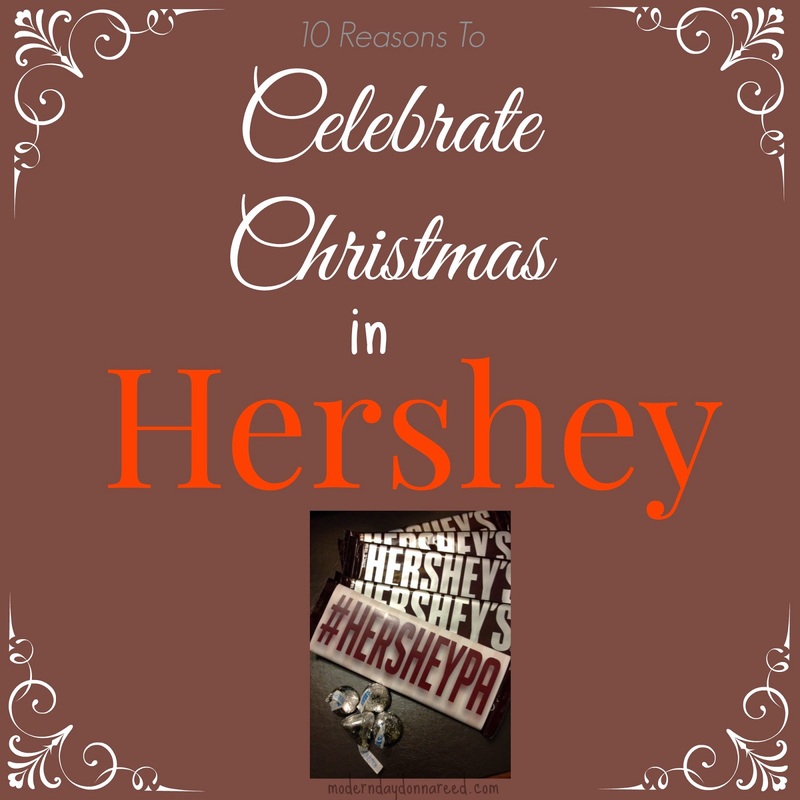 Have you visited Christmas in Hershey? 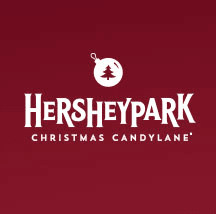 What are your favorite things about visiting Hershey during the holidays? Disclosure: I was provided lodging and entrance into certain attractions. I was in no other way compensated to write this post. All options expressed are my own.